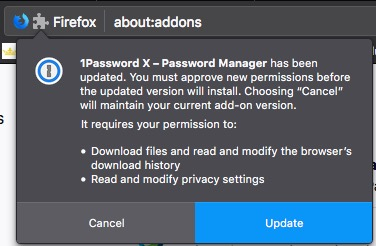 Why is 1PasswordX for Firefox asking me to approve new permissions? Just want to understand the new permissions before I approve them. Thanks! In version 1.11, we've requested additional browser permissions which will help us add additional functionality to 1Password X. The extension will be disabled on update until you accept the new permissions. To add to the original question, why do we have to dig through the release notes for this info? For a security-addon, I would expect you to have a visible link on the addon page ( https://support.1password.com/getting-started-1password-x/ where you get linked if your visit from the addon store), which detailed each requested permission. I can't argue with that. While maybe not everybody will want that level of detail I can't think of a reason why it isn't available for those that do. I shall file a request.